We're here. Our luggage arrived, belatedly, and is unpacked. We're frantically going through every nook and cranny, taking inventory, cleaning, discarding, replacing, adding. This is normal for a boat that's sat idle for 15 months. And there's no place like home. 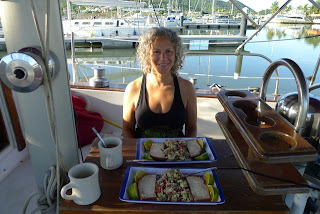 Until we get our dinghy and motor going (more on that in a future post), we're tethered to the slip Rodney Bay Marina.